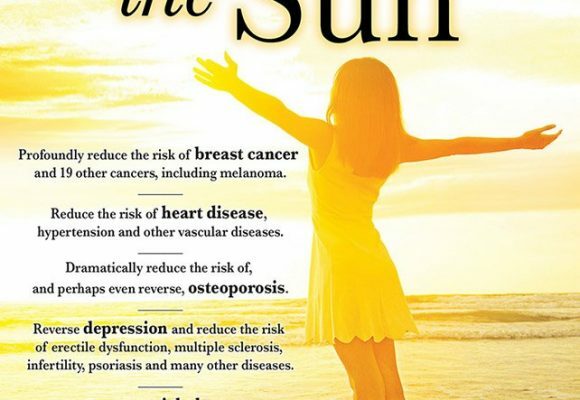 Sun Exposure reduces Obesity; Vitamin D does not. Home Uncategorized	Sun Exposure reduces Obesity; Vitamin D does not. Sun exposure reduces the risk of obesity, and that relationship has been credited to vitamin D. However, one study, conducted on mice, shows that vitamin D may have nothing to do with reducing or preventing obesity. The animals were placed on a high-fat diet to cause obesity. Then they were subjected to long-term exposure to ultraviolet radiation (UVR), (which is the same sunlight spectrum that leads to the production of vitamin D and other photoproducts). The UVR significantly suppressed weight gain and other measures of the metabolic syndrome (MetS), including glucose intolerance, insulin resistance, fasting insulin levels, fatty liver disease and serum cholesterol levels. Interestingly, when the animals were supplemented with vitamin D, no such benefits occurred, meaning that UVR created the positive protections independently. However when nitric oxide was applied to the skin of the animals, the positive effects on weight loss and metabolic syndrome were again observed. Nitric oxide, of course, is another photoproduct of sun exposure, which has many positive health effects. Other research showed that early-morning sun exposure was correlated to lower body-mass index (BMI) which is a measure of body fatness. The authors of that research suggested that the mechanisms involved in weight control by early light exposure could be the following: (1) resetting the circadian rhythm (internal clock), (2) the greater quantity of blue light in morning sun and (3) effects on melatonin production. Whatever the mechanisms, we now know that early-morning sun is important to weight control. It may also be important to other health issues. But before we begin to think that sun exposure is the cure-all for obesity, realize that poor nutritional habits and lack of exercise are much more important. Nevertheless, sun exposure can furnish one more arrow in the quiver of protection from obesity. Get your sun exposure and stay slim! Be careful not to burn. Geldenhuys S, Hart PH, Endersby R, Jacoby P, Feelisch M, Weller RB, Matthews V, Gorman S. Ultraviolet radiation suppresses obesity and symptoms of metabolic syndrome independently of vitamin D in mice fed a high-fat diet. Diabetes. 2014 Nov;63(11):3759-69. To avoid allergies, be sure to be born in sunny seasons! Is your child depressed? Perhaps he or she needs some sunshine! Great outdoors, sun exposure and health.